Why Vision Tools SonoPro ? The Ultrasound Workstation of choice. Vision Tools SonoPro is a very powerful and scalable acquisition and viewing station for ultrasound modalities for archiving, publishing on CD/DVD, processing and printing of ultrasound images. The SonoPro station can be connected to any type of ultrasound machines whether it is dicom or non-dicom "using video grabbing interface" as one of the important features of the SonoPro station is that it can convert the non-dicom ultrasound into a dicom one providing many features of image archiving and processing. Using the Visual filming tool the user can print a complete formatted film in just view seconds to any DICOM printer or even to an A4 windows paper printers. Do windowing, zoom/pan, annotations, multiple measurements. 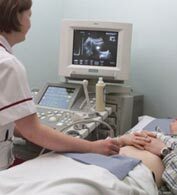 Support for multi-frame images generated from the ultrasound modality. For Non-DICOM Ultrasound, the best interface will be Video grabbing, by which, the SonoPro workstation aided by a remote keypad can acquire images from the ultrasound modalities one-by-one. Retreive DICOM modality worklist from any RIS / PACS server . This eliminates the need to re-insert patient information again before starting examination and acquisition . This add-on is for non-DICOM modalities in a RIS/PACS environment.